"Visited by the Ex-Queen of the French and Suite in 1856, who expressed themselves highly gratified". 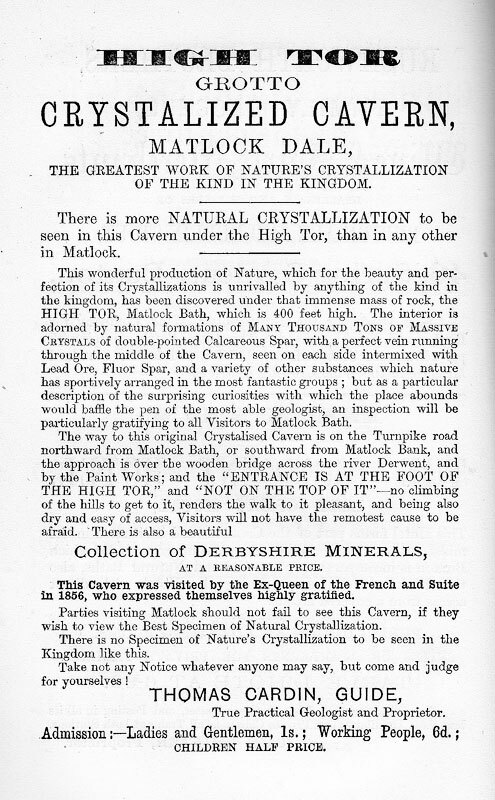 The ex-Queen of the French, Marie Amelia of Claremont Palace, stayed at the Old Bath Hotel for three days and she and her suite enjoyed the delights of the local scenery, including the High Tor Grotto. They seemingly crossed the Derwent via the wooden bridge and used the boats for the return trip ("Derbyshire Times", 30 September 1856). There is more on-site information about the cavern's proprietor, Thomas Cardin, who was a Lead Miner.